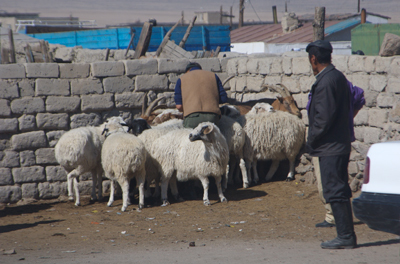 I’ll have to be honest and say that currently I don’t know much about Mongolian sheep. I hope to learn more on the next trip. 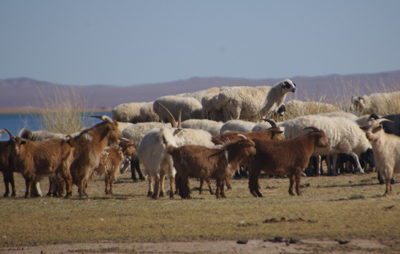 Here are some photos that I’ve taken of sheep. 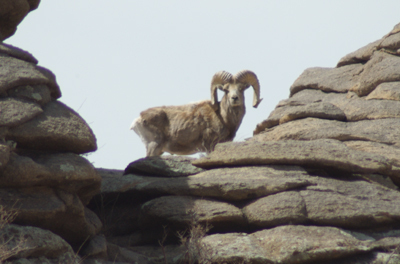 “King of the Mountain” at Khar Us Nuur, also western Mongolia. Goats in the foreground, but that’s for next week. 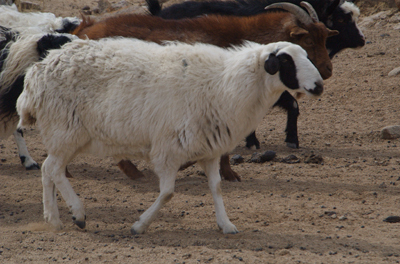 Finally, for comparison, a wild argali, the world’s largest mountain sheep. This old ram with the amazing horns let me follow him around for almost 20 minutes. As you can see, he is very thin. It was late April and a lot of the animals, wild and domestic were in rough shape from the winter. One of the main uses of the wool is to make the big pieces of felt which cover the gers. Depending on the weather, there can be one to three layers. I’ve slept in a ger in cold weather with one layer and the next night, one with two layers and the difference was quite noticeable. One of my most useful souvenirs from Mongolia are my felt slippers. I also got a pair of felt boots. Both are amazingly warm and comfy. I would recommend them to anyone who gets cold feet!